LA would be great to visit around June. The weather would be quite nice and (being an avid gamer) the E3 expo will be on from June 7-9. I’d also love to check out a LA Lakers NBA game, that’s something I absolutely have to do if I go to LA. Now, Thailand is one of those places that I’ve never been, but have heard so much about. Friends keep telling me that I absolutely have to go and check out Thailand. From what I’ve seen it looks like a pretty amazing place, and much different as well which is part of the excitement of travelling abroad when going on vacation. I’ll have to scout some locations in Thailand before I make a decision. I’ve seen a about Vancouver on television, in travel books and magazines and from what people tell me its an amazing place to visit and the people are really friendly. I’d have to take a look around Victoria, head over to Vancouver then if I’m up to it, maybe take a few days and travel down the north-west coast of the US passing through Seattle, etc. Isn’t Niagara falls close by? I still have a bit of time to make up my mind anyway, Anyone have any other good holiday ideas? ← Anyone Trying To Play World Of WarCraft Without Cataclysm? Nice list JD! I only spent 1 day in California and I thought it was great. Why not start in Canada and whilst traveling down through Seattle, go a little further and do LA too. Tag on Vegas too maybe? Niagara falls is a little out of the way I’m pretty sure. On the boarder of Canada and USA.. But over the east side of the continent I’m pretty sure. I looked into going there when I was in new York – it was an 8 hour bus trip though.. And pretty expensive, so we passed on that. Make sure you see an ice hockey game!! I saw ny islanders vs ny rangers at Madison square garden. It was a trip highlight for me and I know zero about ice hockey. 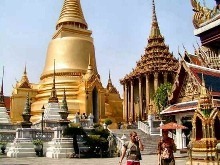 Wow..Justin Great information shared in this blog, if we talking about destinations, Thailand is a suitable place for traveling. There are many stunning beaches, elegant nigh life and resorts that make your trips memorable. I hope soon you will add more blogs on Thailand. I will recommend to all traveler just check once time in a life to check natural beauty of Thailand. Thanks for the comment William, really appreciate it.